The advent of a smart door lock means that the days of losing your keys or forgetting your combination and being locked out of your house are almost, but not quite, gone. The Kwikset Kevo is a smart door lock with a feature that makes it one of the easiest to lock and unlock. With Kevo smart door locks, all you have to do is touch the lock and it will sense that you’re outside and unlock the deadbolt itself. Additionally, the backup traditional keyway is designed with Advanced SmartKey technology. And it protects it against lock bumping and picking. But currently, there is no app for either Windows or Blackberry and the Android app is only compatible with select devices. The Kwikset Premis is a dead bolt replacement with both a keyway and a keypad to lock and unlock it. The Permis smart door locks also pair with iOS devices as well as other Apple HomeKit-enabled devices for local and remote access. However, unlike most other options listed here, it only connects with Apple devices, so unless you’re planning on buying an iPhone/iPad/iPod Touch/etc. in the near future, this isn’t the lock for you. The SmartCode 916 allows you to choose between Z-Wave or ZigBee home automation connectivity. But it also offers several improvements over previous editions of smart door locks and deadbolts. This lock incorporates both 128-bit encryption and a patented side-locking bar technology that defeats lock bumping. Although this is one of the most versatile connected deadbolt options, it doesn’t offer Bluetooth connectivity. 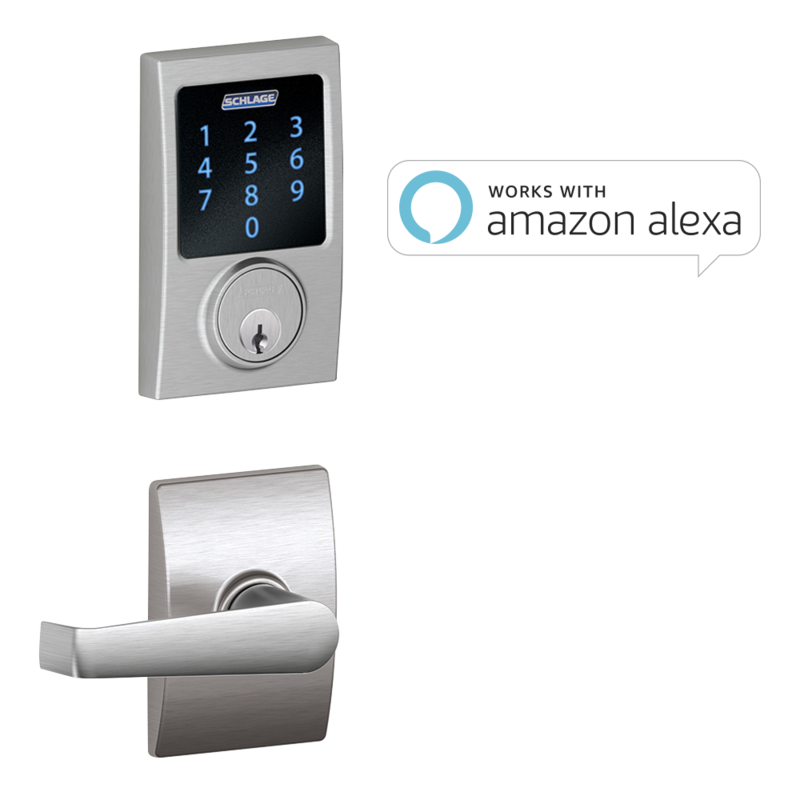 And all remote interaction with the lock is through the Z-Wave or ZigBee connection with an Internet-connected home automation system. The Schlage Sense smart deadbolt replaces a standard keyed deadbolt and gives you three ways to lock and unlock the deadbolt. Family members who don’t have cell phones can use the key or tap in an access code to unlock it. Also, you can pair the app on your phone with the lock using Bluetooth. And it will allow you to lock and unlock your door from anywhere if you’ve also put the lock on your home’s Wi-Fi network. Although it is Apple HomeKit compatible, it does seem to be missing the ability to open the door automatically as you approach, allowing you to have both hands full of groceries and walk straight in. Also, remote access requires that there be an Apple TV in the home and within 40 feet of the lock. Using Wi-Fi to connect components of your home automation system is passé. Z-Wave is the wave of the future in smart door lock home automation. Schlage’s Connect smart lock gives the same means of locking and unlocking the lock. But it also uses Z-Wave to integrate with most home automation systems on the market. Connect also has a keypad so kids and dog walkers can be given their own unique combinations/passcodes. Connect trades Apple HomeKit integration for Amazon Alexa integration when you’re using a third-party alarm or home automation system. This is basically the Schlage Connect mentioned before paired with utilitarian Elan Lever. And this smart door lock allows you to open your front door with your phone and an elbow with your hands full. Also, Z-Wave allows it to connect with home automation systems and it also connects with Amazon’s Alexa. Although it also lacks the proximity unlocking feature of some other smart lock offerings it’s quick and easy to install and holds 30 user codes for the keypad. Yale’s Real Living Key Free Deadbolt (YRD240) replaces your traditional keyed deadbolt with a sleek keypad to lock and unlock the door. This is another offering that doesn’t have Bluetooth connectivity for easy and direct phone access. Although it does come with your choice or either Z-Wave or ZigBee connectivity to connect to most home automation systems. A 9V battery powers the smart door lock in the event the radio batteries die. And ensures that you can always get in your house. The Assure Smart Door Lock line of Yale smart locks comes in seven different versions. The Assure Lock Interconnected Lockset (YRC216, 226, 246) has a high-tech hotel room door look. And the Assure Lock with Bluetooth (YRD446) (pictured) is simply the Real Living Key Free Deadbolt with Bluetooth connectivity for direct cell phone access. Although all seven versions connect with most home automation systems, only one of them offers Bluetooth connectivity. The August Smart Door Lock Pro is a full-featured but discrete smart deadbolt. And means is that you only replace the portion of the deadbolt on the inside of the door and leave the existing keyway on the outside. You can then lock and unlock the deadbolt by twisting it from the inside, using the phone app, or vocally using Google Assistant, Alexa, or Siri. And other home automation systems work like Nest, Airbnb and HomeAway. August also allows you to integrate it with a keypad and/or a doorbell camera for added convenience and security. The Smart Lock Pro also unlocks as you approach the door and locks again when you close the door after yourself. The small size of this product means that it requires the August Connect Wi-Fi bridge for the home automation connectivity. Although the basic Lockitron Bolt is listed as a keyless smart door lock solution, there is a bolt option with key match. And this feature allows you to lock and unlock the deadbolt with your old key(s). This means there’s no hassle of having to get copies for everyone. Bolt has a Bluetooth Low Energy radio so even if the power or internet goes out, you’ll always be able to lock and unlock it even if you go keyless. Bolt also has what Lockitron calls Locktiron Sense so that you don’t have to have the phone in your hands when you get home. Danalock is easily the smallest and sleekest smart door lock on the block. Yet it offers powerhouse features locks ten times its size don’t offer. For instance, it has AES 256 encryption for maximum security of the wireless signals it uses. It also senses when you’re coming and going and will lock and unlock the door automatically for you. Danalock also has what the company calls twist assist. Which lets you start turning the knob and the lock will turn itself the rest of the way to lock or unlock. The main drawback of the Danalock is that it is only available from three North American online retailers. Friday Labs says its Friday Lock is the smallest smart door lock in the world. Friday is also one of the locks from smaller companies that offer the “unlock automatically and interaction-free” feature. And Friday lock is quick and easy to install and comes with several shell covers to match any home décor. Unlike any of the previous offerings, Friday also has a rechargeable battery, however, at $249 it’s one of the more expensive locks here. The ENTR smart door lock from Mul-T-Lock is unique. And this is because it gives the added security of being able to use fingerprint recognition to lock and unlock the deadbolt. The battery for the ENTR lock is rechargeable and you can even buy a wireless charging device for it. And there are apps for both Android and iOS, but not for Windows or Blackberry. “Open Sesame” were the words that were supposedly used by Aladdin to gain access to treasure. Sesame is a discrete smart door lock deadbolt that is attached over your existing deadbolt thumb twist using adhesive. And it has the automatic lock and unlock feature that works as you approach the door. Also, the app allows you to knock twice on your phone’s screen to lock and unlock the door. This product requires that you have a clean and polish/oil-free surface on the door around your deadbolt or the adhesive won’t stick. The IKILOCK smart door lock is simply beautiful to look at. It will complement any interior décor. It also installs on the inside of your door so you can combine the traditional keys you’re used to with remote and cellular access. And the IKILOCK doesn’t connect directly to your Wi-Fi or your home automation system itself. So if you want remote access you’re also going to need the additional IKICENTER.